Turkey Point Property Owners Assoc. I enclose herein a copy of the original plat filed in the County Court House back in 1941 when the island was subdivided. I have colored the property owned by the Association in yellow. There is Beach Three - better known as the Community Beach - where the Community Pier is located. There is also Beach One - at the end of Ramsey Drive. It is a small beach, behind the two breakwaters located there. Adjacent to that beach is what we call the ?Cloud? Beach - colored in pink. The Cloud family owns that property - along with the marsh and the field. They allow residents to use that beach, but ask that it be kept clean of trash. Beach Two was located at the tip of the island, but has washed away. We still have steps leading down the hill, and a 10 foot wide place to walk along the shore toward the point. We are just completing the improvements at the end of Brice Drive, by building a ?Terrapin and Horseshoe Crab Sanctuary? there. It is not a ?beach? to sit on, but we will be installing a small bench for people to sit and view Ramsey Lake from this peaceful spot. All community property is only to be used by residents and guests - the ?public? is not allowed on our beaches. In addition, please find attached a ?Brief History & Facts? concerning our precious island. I hope this provides clarification of community owned properties, however, please feel free to call me or any board member if we can be of any assistance. In 1941, when this community was subdivided, among the Land Records of Anne Arundel County certain ?Restrictions? were recorded (copy attached). These ?Restrictions? are now commonly known as ?Covenants?. These covenants run with the land - each and every property here on Turkey Point Island. Your settlement attorney or title company, when you purchased your property, by law, should have provided you with these restrictions since they concern your property, and are a part of every complete title search done by them. If they did not notify you, or provide such records, please notify them to rectify their negligence and prevent it happening again to someone else. Your ?Lot Assessments? were set in 1941 when the Covenants were recorded, and remain at $10.00 per lot. By law these ?assessments? become a lien on your property if not paid. These assessments provide very limited funding to maintain and/or improve ?common areas? that remain here. Those common areas are the ?Community Beach and Pier?, Beach One and Beach Two. Additionally, the new ?Terrapin and Horseshoe Crab Sanctuary? at the end of Brice Drive. In 1979 the original land developer, Waterfront Estates, deeded all the common areas to the Turkey Point Property Owners Association, Inc. (TPPOA). Since that time it has been the responsibility for the TPPOA to maintain and improve those common areas. Although much of that common area has been lost to erosion, there is still a small part of ?Beach One? at the end of Ramsey Drive, the walkway and stairs to Selby Bay where Beach Two used to be, the Community Beach (Beach Three), and the new Terrapin and Horseshoe Crab Sanctuary located at the end of Brice Drive. In 1991 the Association was able to construct the ?Community Pier? located off Beach Three. We are still completing the Terrapin Sanctuary, and ongoing repairs to Beach One (due to the damage from Isabel). Additionally, we recently rebuilt the stairs to Selby Bay. The lot assessments are used to fund these activities. Our Homeowners Association, established in 1956, provides social activities for residents. Dues for the Association are voluntary. They are $15.00 annually, these funds providing for the social activities such as Turkey Point Island Day, Halloween, etc. We attempt to have the social activities ?pay for themselves? as we sometimes do not have enough funds from the lot assessments to pay for needed repairs to community property and dues can then help pay for such repairs. As stated previously, assessments are mandatory, dues are not. However, only dues paying members are eligible to vote on community matters. THESE BY-LAW REVISIONS WERE APPROVED AND BECAME EFFECTIVE DECEMBER 1, 1992. THE CHANGES WERE NEEDED TO BRING THE BY-LAWS INTO AGREEMENT WITH PRESENT DESIRED PRACTICE OF HAVING A LARGE BOARD SO AS TO INSURE FAIR REPRESENTATION FOR THE ENTIRE ISLAND. PLEASE FILE THIS UPDATE INFORMATION IN YOUR BLUE COVER DIRECTORY OR WITH YOUR COMMUNITY INFORMATION FILE. The business of the Association shall be conducted and regulated by a Board of Directors comprised of at least seven individuals all of whom shall be from the voting membership of the Association as set forth in Article III, Sections 1 and 2. An individual shall not be elected to office unless he/she is in good standing. Directors in office who during their term of office fail to qualify under Article III, Sections 1 and 2, shall not exercise the duties of their office. The Board of Directors shall be comprised of the President of the Association, the Vice-President of the Association, the Executive Secretary-Treasurer of the Association and at least four other members who are not officers of the Association. Fifty percent of the Board shall constitute a quorum for any meeting of the Board of Directors. TURKEY POINT PROPERTY OWNERS ASSOCIATION, INC.
1. All homes arid additions to existing homes must meet the minimum standards as set by the Anne Arundel County Code and Critical Area Criteria. 2. No home may be erected with a height of more than 35 feet, or 2-1/2 stories. Height shall be determined as the vertical distance from the lowest point of the structure at grade to the highest point of the structure, not including accessory fixtures attached to the structure (chimneys, weather vanes). 3. Grade of structure is determined by the average grade of the structure site prior to any disturbance. 4. No structures, fences, piers, walkways, etc., may be erected on any land that contains a perpetual right of way or right of use applicable to the entire community. 5. Structure shall be placed on the lot so as to minimize interference with adjoining structure views, in-so-far-as possible under code requirements. 6. Whenever possible, central air conditioning units will be placed at the rear of the structure, not within the side or front building restriction lines in order to minimize noise disturbance to existing adjacent homes or homesites. When a building is placed within ten feet of the side lot line, the central air conditioning unit is always to be placed at the rear of the structure. 7. All plans, specifications and site plans shall be submitted to the Board of Directors prior to any construction. Plans will be reviewed by the Board monthly, on the First Tuesday of each month from September through June. The Board will issue a written acceptance/rejection within five working days. Special request may be made to the Board to review plans in July and August, subject to availability of sufficient Board members to meet a quorum. These guidelines were submitted to the General Membership at the September 18, 1996 General Meeting. They were approved with the addition of #3 and are being supplied to all property Owners. 1. Residents and their guests ONLY are allowed on our beaches and both must have identification as issued by the Turkey Point Property Owners Association (TPPOA). 1. All cars on parking lot(s) must have similar proper identification. 3. No trespassing on adjoining properties. 4. No one allowed on beach or parking lot(s) after midnight. 5. Use trash barrels ? DON?T LITTER! 6. No unleashed dogs are allowed on the beaches..
7. Approval of a TPPOA officer must be secured in advance for a beach party. 8. No fires are allowed without permission of TPPOA. 1. The said property hereby conveyed shall be used for residential purposes only and shall not be used for any commercial or manufacturing purposes of any kind or nature. 1. The lots in Block No.3 as shown on the said plat shall only be sold to and owned by a lot owner, in Block ?A? and Blocks Nos. 1, 2, 3, 4, 5, 6, 7, 8, 9, 19, 20, and 21 as shown on the aforesaid plat, and shall be used for the sole purpose of a private beach and for the purpose of private dockage; no dwelling or living quarters shall be erected on any lot in said Block No.3 as shown on said plat and the only buildings that shall be erected thereon shall be a private bath house and a private boat-house; and no bath-house shall be constructed at a cost of less than $100.00, and the same must be painted and kept in a presentable condition at all times. The lots in Block No. 3 shall not be sold except in conjunction with a lot in the above set out Blocks in this restriction, and shall not be sold to or used by any person or persons other than an owner of a lot in the herein above set out Blocks in this restriction. All bathhouses or other buildings other than a boat house shall be erected within that part of the lot designated for bath-houses as shown on the plat of ?Turkey Point?. 1. No outside toilet shall be constructed upon any of the lots as shown on the herein above referred to plat and no sewage of any kind shall empty into the waters of the Chesapeake Bay or South River or any tributaries thereof, and all houses must be provided with cesspools or septic tanks or other similar devices for the sanitary disposal of waste matter, and said systems must comply with the health and sanitary laws of the State of Maryland and of Anne Arundel County. 1. No solid board fences shall be maintained on any of the lots as shown on the aforesaid plat, and no type of fence or hedge shall be maintained on any of said lots as shown on the aforesaid plat at a height of more than 48 inches. 1. No chickens, poultry, pigs or live stock of any kind shall be kept on the property, and no dogs or cats or other domestic animals shall be kept except those that are household pets, and the same shall not be allowed to run at large. This restriction shall not apply to Blocks ?A? and ?B? as shown on the aforesaid plat. 1. There shall be an assessment of $10.00 per year against each lot sold in said subdivision by Waterfront Estates, Incorporated, its successors or assigns, with the exception of Blocks ?A? and ?B? (which assessment is hereinafter set forth) which assessment shall be due and payable to the said Waterfront Estates, Incorporated, its successors or assigns, on the first day of July of each year, which said assessment shall constitute a first lien on said lots so sold and conveyed, and shall be enforced by said Waterfront Estates, Incorporated, its successors or assigns, by due process of law; at the expense of said fund, said assessment to be used in the discretion of the said Waterfront Estates, Incorporated, or its successors or assigns, for the upkeep of roads, walks, ways, bridges, wharves, and beaches until such time as such roads, walks, ways, bridges, wharves, and beaches are taken over by the County or State or some other agency. Block ?A? shall be assessed $50.00 per year and Block ?B? shall be assessed $25.00 per year as herein above provided in this restriction. 1. Said Waterfront Estates, Incorporated, its successors or assigns reserve the right at any time to zone the subdivision with respect to restrictions for business purposes and when so zoned, no building shall be built, occupied or used for any business purpose except within said zone and then under such restrictions and conditions as shall be provided for in said zoning restriction. 1. The fee simple title to all streets, roads, walks, ways, bridges, wharves, and beaches is reserved to the said Waterfront Estates, Incorporated, its successors or assigns, and the said Waterfront Estates, Incorporated, its successors or assigns, reserve the right to authorize the construction of all public utilities along the said streets, roads, walks, ways, bridges, wharves, and beaches and along the rear line of any lot as shown on the aforesaid plat. 1. Waterfront Estates, Incorporated, its successors or assigns, reserves the right to go upon vacant lots in said subdivision as shown on the aforesaid plat at any time and cut grass or weeds at the expense of the lot owner or owners. 1. No nuisances of any kind shall be permitted on any of the lots as shown on the aforesaid plat, and there shall be no picnicking, camping or living in tents or garages on any of the lots in said subdivision, and there shall be no disrobing in automobiles nor bathing therefrom. 1. Beach No.2 as shown on the aforesaid plat is reserved for the exclusive use of the owners of Block ?A? and the owners of lots in Blocks Nos. 1, 2, 3, 4, 5, 6, 7, 8, 9, 19, 20, and 21 as shown on the aforesaid plat. 1. Beaches Nos. 1 and 3 as shown on the aforesaid plat are reserved for the use of the owners of all of the lots as shown on the aforesaid plat. Waterfront Estates, Incorporated, its successors or assigns, reserve the right to grant the use of Beaches Nos. 1 and 3 to the owners of lots in the remainder of the tract, known as the ?Little Island,? the same being the balance of the track known as ?Turkey Point,? as conveyed to Waterfront Estates, Incorporated, by William A.. Tuerke and wife by deed dated the 6th day of March, 1941, and recorded among the Land Records of Anne Arundel county in Liber J. H. H. No. 233, folio 156, whenever the same shall be subdivided or sold. 1. In the event Blocks ?A? and ?B? as shown on the aforesaid plat are subdivided by the owners thereof, they shall not be subdivided into lots of less than 50 feet by 150 feet, and only one building shall be erected on each lot as herein above more specifically set out in Restriction No. 2, and all of the restrictions herein set out shall apply to them. 1. No pigs shall be kept on Block ?A? and ?B? and no chickens, poultry, or live stock shall be kept on said Blocks as shown on said plat unless the same are kept within an enclosure and shall not be allowed to run at large, and no nuisances of any kind shall be permitted on any of said Blocks. 18. Waterfront Estates, Incorporated, its successors or assigns, reserves the right to erect, maintain, and operate a central water system for said subdivision and if such a system is installed, it shall not be deemed a violation of any of the restrictions herein above set out. 19. The invalidation of any one of these covenants and restrictions or any portion thereof by judgment or decree of any court or in any manner whatsoever shall in no wise affect any of the other covenants and restrictions, or any portions of said restrictions not invalidated by said judgment or decree, and the said covenants and restrictions or portions thereof not so invalidated shall remain in full force and effect. 20. These covenants and restrictions shall run with the land hereby conveyed and shall be binding on the Grantees, their heirs and assigns. TURKEY POINT PROPERTY OWNERS' ASSOCIATION, INC. 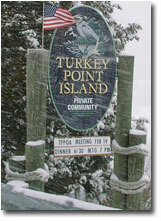 The name of the Association shall be Turkey Point Property Owner's Association, Inc. The principal office of the Association shall be the residence of the current Executive Secretary-Treasurer. ?Association? shall mean and refer to the Turkey Point Property Owners's Association, Inc., a non-profit corporation organized and existing under the laws of the State of Maryland. ?The Properties? shall mean and refer to all properties, both lots and Common Areas as defined in the Plat Records of Anne Arundel County, Plat Book 17, folio 47. ?Common Areas" shall mean and refer to those areas of land described by the Deed made on December 21, 1979, and recorded on December 28, 1979, Liber 3277, Page 74 of the land records of Anne Arundel County. Said areas are intended to be directed to the common use and enjoyment of all members of the Association as herein defined. ?Lot? shall mean and refer to any plot of land intended and subdivided for residential use, but shall not include the Common Areas as hereinbefore defined. ?Owner? shall mean and refer to an owner of record, whether one or more persons or entities, of the fee simple title to any lot, but shall not mean or refer to any mortgagee or subsequent holder of a mortgage, unless and until such mortgages or holder has acquired tide pursuant to foreclosure of any proceeding in lieu thereof. ?Member? shall mean and refer to all those owners who are members of the Association as provided in Article Ill, Sections 1 and 2. Every owner of record of one or more lots is a member in the Association. Every owner of record who is current with his/her lot assessments and other payments that may be due the Association and has paid all dues prescribed by the Association shall be a voting member. Persons qualifying under Section 3 above shall have the tight to grant another member of the Association the power to cast his/her vote as if he/she was in fact voting. Section 5 - Proxy Limitation. A single member may cast only two proxy votes. The proxy must be in writing and duly signed by a voting member authorizing such. The name of the member to whom the proxy right is given must be set forth. All proxies must be presented to the Executive Secretary-Treasurer prior to the commencement of any meeting at which the proxy is to be used and will only be effective for that meeting. Every owner of record shall have a right and easement of enjoyment in and to the Common Areas and such easement shall be appurtenant to and shall pass with the title to every lot. The Association shall retain title to all Common Areas. The Association has the right to dedicate or transfer any part of the Common Areas to any public agency, authority or utility for such purposes and subject to such conditions as may be agreed to by the Members, provided that no such dedication or transfer, determination as to the purposes or as to the conditions thereof, shall be effective unless an instrument approved by two-thirds of the voting members has been recorded at a special meeting called for that propose, provided notice of the proposed action is sent to every Member at least 30 days in advance of the special meeting. The business of the Association shall be conducted and regulated by a Board of Directors comprised of seven individuals all at whom shall be from the voting membership of the Association as set forth in Article III, Sections 1 and 2. An individual shall not be elected to office unless he/she is in good standing. Directors in office who during their term of office fail to qualify under Article III, Sections 1 and 2, shall not exercise the duties of their office. The Board of Directors shall be comprised of the President of the Association, the Vice-President of the Association, the Executive Secretary-Treasurer of the Association and four other members who are not officers of the Association. The term of office for each Director shall be one year. There shall be no limit to the number of terms a Director may serve. Vacancies on the Board of Directors shall be fined by appointment by a majority of the remaining Board of Directors in open session. The so-appointed Director shall serve only the remaining term of his or her predecessor. Directors shall serve without compensation except for the Executive Secretary-Treasurer who may be paid a yearly compensation as determined by the Board of Directors or, if the Executive Secretary-Treasurer contracts for assistance to carry out the functions of that office, such expenses shall be paid as determined by the Board of Directors. Election to the Board of Directors shall be made at a meeting of the Association in the fourth quarter of the calendar year and installed in the following January. The election shall be by written ballot. Ax such election each member or his/her proxy shall have one vote for each vacancy on the Board of Directors. The election shall be conducted by a committee of at least three members appointed by the President and shall be known as the Election Committee. The Election Committee shall submit to the President a full raster of candidates, (at least one for each office) not less than one week prior to the stated Association meeting whereat the election is to take place. Any member may present a nomination to the Election Committee. Such nomination must be in writing and shall bear the assent of the nominee in writing. Nominations for each office may be made from the floor. Each voting member shall be entitled to only one ballot. All rules and procedures not covered herein shall be at the discretion of the Election Committee. The President of the Association shall be the Chairman of the Board of Directors and shall conduct the meetings of the Board. In the President?s absence, the Vice-President shall preside. Likewise, the President shall preside at the Association meetings with the Vice-President acting in the President's absence. (c) to take any and all action necessary to insure successful operation of the Association in all respects. (g) to establish a procedure for the handling of the funds of the Association by the Executive Secretary-Treasurer. The Board of Directors shall meet at least quarterly to conduct the business of the Association in accordance with Article VII. The Board of Directors may have additional meetings as it may deem necessary. The specified meetings of the Board of Directors shall be open to the membership. Admission of the membership to any additional meetings of the Board of Directors shall be at the discretion of the Board of Directors. (a) A special meeting of the Members will be called by the President, or in the event the President (as a Director) is involved as defendant, then by the Vice-President, whenever a Petition for Removal bearing the signatures of one-third of the voting Members is flied with the Executive Secretary-Treasurer. This special meeting must be held in not less than 15 days, nor more than 25 days after the Petition for Removal is filed. (b) in not more than five days alter the filing, a Bill of Particulars must be provided the Director under removal action. The Bill of Particulars will include the substance of the charges to be presented, the appointed prosecutor, the name(s) of the principal plaintiff and witnesses to be called. (c) The President, except as otherwise stated in Section 1, herein, will appoint a voting Member in good standing as prosecutor. (d) The voting Members will sit as a committee of the whole with the President as presiding officer (chairman), except as otherwise provided for in (a) above. (e) The removal will be conducted as an administrative bearing, utilizing the civil process rather than a strictly adversary or criminal proceeding. (f) Upon completion of the presentation of the charges and an adequate opportunity for presentation of a defense, the presiding officer will put the question for removal to the voting Members, or their proxies, present. The officers shall be a President, a Vice-President, and Executive Secretary-Treasurer all of whom shall be members of the Board of Directors. The officers shall be elected by a majority vote. Officers shall not hold office unless in good standing. Each officer shall hold office for a period of one year except any officer appointed to fill a vacancy shall hold office only for the unexpired portion of such term. The President shall preside at all meetings of the Board of Directors, except as otherwise prescribed in Article IX, and shall see that orders and resolutions of the Board are carried out. The Vice-President shall carry out the duties of the President in his/her absence. (a) Record the votes and keep the minutes of all proceedings in a book to be kept for that purpose. (b) Notify the Members as to the date and time of general meetings of the Association. (c) Keep the records of the Association. (d) Maintain a record of the Members of the Association together with their addresses. (a) Receive and deposit in appropriate bank accounts all monies of the Association. (b) Disburse such funds as directed by resolution of and in the manner prescribed by the Board of Directors. (c) Keep proper books of account and cause an annual audit of the association books to be made at the completion of each year. While the Executive Secretary-Treasurer is the principal disburser of the Association's funds, the Board may, at its option, require one or more officers' signature for all checks written and may appoint an Assistant Treasure or acting treasure in the absence of the Executive Secretary-Treasurer. The Association shall endeavor, at its expense, to secure surety bonds for all persons who may disburse the funds of the Association. The President with approval of the Board of Directors shall appoint any and all committees as deemed desirable for the successful operation of the Association. The general meetings of the Association shall be held at the time and place set by the Board of Directors. Special meetings of the Association for any purpose may be called at any time by the board of Directors or upon written request, filed with the Executive Secretary-Treasurer, by one-fifth of the Members. Notice of any general meeting of the Association shall be mailed to each Member of the Association not less than seven days prior to the day of the meeting. The presence at a meeting of the Association of one-fifth of the Members shall constitute a quorum for any action governed by the By-Laws unless said By-Laws specifically provide otherwise. Proxies may be counted to provide the requisite quorum. All Association meetings are open to the Members and others having an interest in said meetings. The Association and Board of Directors shall operate under such rules of order as may be adopted by the Board of Directors. In the event of a conflict or a situation in which the adopted rules of order do not cover the situation, the proceedings shall be governed insofar as possible by Roberts Rules of Order, Revised. These By-Laws may be amended by a two-thirds vote of the voting Members. Proposed amendments to these By-Laws shall be presented to the Board of Directors who will then be obligated to present same at the next schedule meeting of the Association. Proposed amendments should include a commencement date. Proposed amendments presented at a meeting may not be modified in any manner at that time.